Majority Leader Harry Reid (D-Nev.) threw his attack on the GOP into high gear Wednesday afternoon, accusing Republicans of "making love to Wall Street." Reid has been slamming Republicans for obstructing progress on financial regulatory reform legislation for as long as its been debated, but Wednesday's move was the most blatant shot at the GOP's motives. "The Republicans are having difficulty determining how they're going to continue making love to Wall Street," Reid said. Reid is known for making harsh comments – like saying President Bush is a “loser” and declaring that the war in Iraq was “lost” – but his spokesman did not back down from this moment of senatorial color. Jim Manley, Reid's spokesman, took the description one step further. The majority leader cited weeks-long talks between top negotiators Chris Dodd (D-Conn.) and Richard Shelby (R-Ala.) as well as three procedural votes to open debate as evidence of Republicans reluctance to move forward on the legislation. 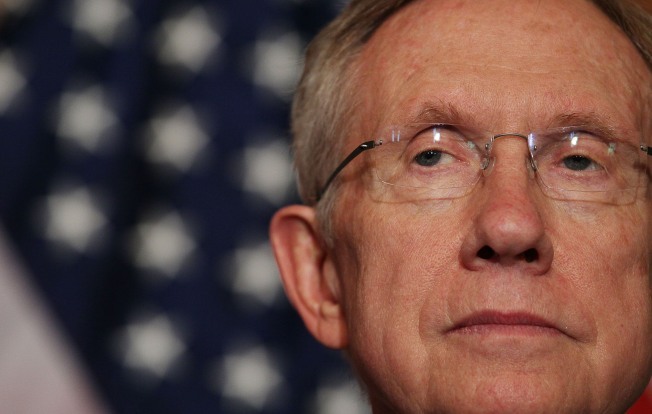 The timing of Reid’s attack was odd, however, given Dodd's announcement on the floor earlier Wednesday morning that he felt close to an agreement with Shelby and that the first two amendments of the bill could pass by unanimous consent. "It's obvious that they do not want to put any decent restrictions on what Wall Street has done or are doing," Reid said.